Commercial and residential heating and air conditioning specialists are only a phone call away. We provide professional HVAC services throughout Yukon, OK and central Oklahoma, and we’ve been doing this since 1953. We have always stayed up to date on the latest diagnostic tools and new AC and heating installations, and our technicians make sure you are 100% satisfied with the work. These are only a few reasons to trust our team. Call us to receive excellent customer service from beginning to end for your next HVAC installation or service. Comfort Incorporated keeps your family safe, healthy, and comfortable. If you notice any problem with your heating system big or small, it’s important to call in technicians ASAP. When you wait too long, the problem can worsen, resulting in a broken–down furnace in the middle of winter and higher bills. It could even make your home unsafe. And for any heating installation or service, you should only call in trained, experienced, and skilled professional HVAC technicians. We invest in some of the best diagnostic equipment so we can be sure the job is thorough and your heating system is safe. Not sure if a small problem indicates that you really need to call in a heating technician? Often, it does. A temperature discrepancy may be more than a minor thermostat issue. It could indicate a safety problem or electrical troubles within the furnace. You should call in technicians for heating repair no matter what type of trouble you have, whether you hear a strange noise from the heater or feel it start up and shut down too frequently. Can you imagine going through the summer with no air conditioner in Yukon, OK? Even a couple of days without AC can seem daunting where the heat and humidity can sometimes feel overwhelming. But you don’t have to worry about going without when you call the experts at Comfort Incorporated for your next AC service. Our maintenance plan members receive 24–hour emergency services. 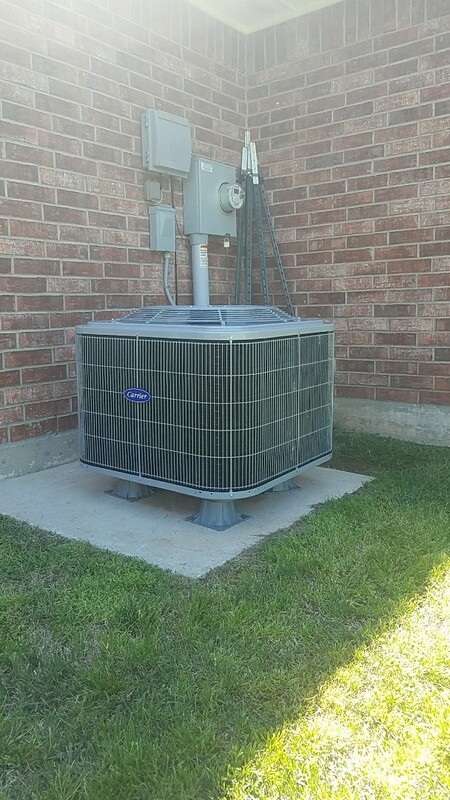 And we are happy to help with any air conditioning or heat pump service, whether you need a small capacitor replaced, service for your compressor, or a brand new AC system. How Do You Know if You Need AC Repairs? AC repairs should be taken care of as soon as possible. You should call in a technician for any of these problems: odd noises from the indoor or outdoor unit, uneven cooling throughout rooms, short–cycling (starting up and shutting down often), high temperatures, or anything that alarms you. You may need an air conditioning replacement, but we will see that you get the best system or service either way. Our professional commercial HVAC services can help your business to thrive. You have a lot to think about as a commercial property owner or building manager, and even if you have a maintenance crew on staff, nothing compares to the training and expertise of a professional commercial HVAC specialist. Call our team for your next commercial HVAC service, and work with someone you can trust to do the job right. We have been in business since 1953. You may suspect you need air duct services if your AC system or heater just does not seem to get the home up to the temperature you need, or if some rooms are cooler or warmer than others. Air duct sealing and repair can help to resolve heating and cooling inconsistencies and lower your bills. We can test your ducts for inefficiencies and then make sure the system runs at maximum efficiency after we are through. We provide complete energy audits to help determine if you need duct repair and sealing, duct cleaning, air sealing, or additional insulation. Call Comfort Incorporated for your next duct and home performance service in Yukon, OK. I have used Comfort Inc for many years now. They show up when they say and they are thorough. Their employees seem knowledgeable and are very courteous. Satisfied customer. Travis and comfort inc. did a great job replacing my old air conditioner. scheduling was fast and timely. Travis and Mekko arrived on time and got right to work. Travis walked me through programming the thermostat and was very thorough and courteous. Travis was right on time, and took care of everything, even checking our filters (which my husband had changed last week) If we would have known that Travis would be checking them, would have waited - good to know for in the future. System is back up and running great. A/c and coil replacement in Yukon.